The Sweetbriar Cottage is a lovely cottage for your child to play in. This small cottage kit features a child sized door, and a working window with safety glass. Panelized wall sections will save you building time, allowing you to quickly get your child's new playhouse into use. 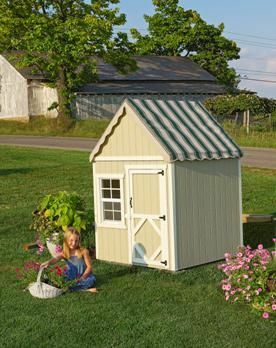 This playhouse is small enough to be used inside or outside, with an awning roof cover available in multiple colors.